Travel Booking Pro is the travel companion you have been looking for! You can quickly create a travel booking website for your travel and tour company without writing a single line of code. 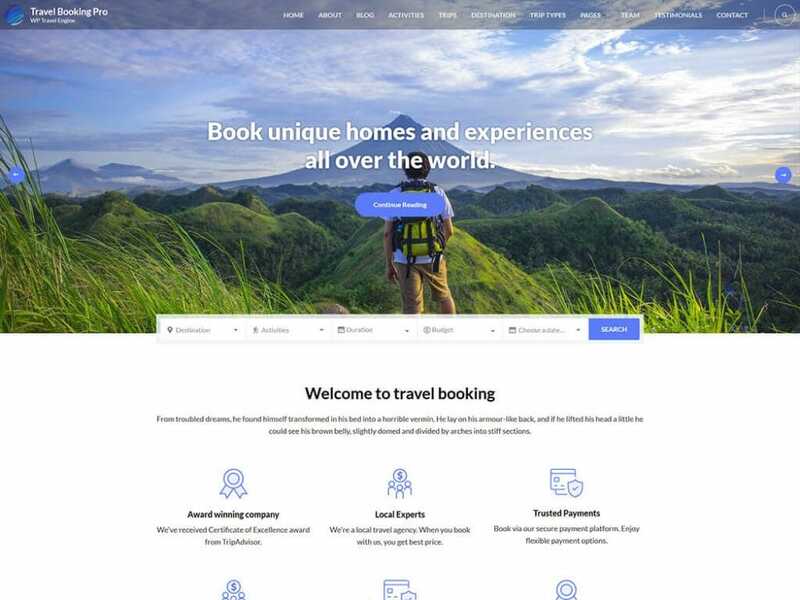 If you are a travel and tour operator, this modern and advanced premium travel booking WordPress theme will help you save time and money with its easy-to-use features. In just a few clicks, you can add trips, destinations, and trip types, feature travel activities, highlight your specialties, and allow visitors to book the trips online. You can also seamlessly add features like Fixed Trip Starting Dates, Trip Reviews, Group Discount, advanced Trip Search, and multiple payment gateways with premium add-ons. The intuitive and stunning design combined with useful features required by a travel company will help you increase your bookings and sales. On top of all these features, Travel Booking Pro WordPress theme is speed optimized, SEO ready with schema friendly code, and displays flawlessly on every screen size. You want to build a complete travel website without writing a single line of code. You are using WordPress to build your travel and tour company’s travel booking website. You are looking for a premium web template to display the travel services (destination, trips, activities, adventures, etc.) on your website. You run a travel or tourism company or agency and want to show your visitors why you are the best. You want a travel website that displays travel destinations, tour packages, the complete itinerary of a trip, the activities one can do in those locations, the cost of the trips, and other details. You want a clean, responsive, SEO-friendly, and speed optimized website. You are looking for a great design on the front-end and easy to use content management system on the back-end. Your client wants a beautiful and easy-to-use website fast for their travel company or agency. You can import all the images, text, and settings from the live demo of Travel Booking Pro theme with a click for free because we believe you should spend more time on your venture than on setting up your website. More than 50% Google searches are done on mobile devices. Travel Booking Pro is a fully responsive mobile friendly WordPress theme. The theme automatically adjusts itself to screen sizes of various mobile devices and tablets so that your website looks flawless on every device and offers smooth user experience. You can reach a wide range of customers with the fully responsive design. Travel Booking Pro WordPress theme passes Google mobile-friendly test. This means better rankings in search results. With 5 Header Layouts Option on Travel Booking Pro, you can customize and create a unique website with a simple click. Travel Booking Pro is fully compatible with our WP Travel Engine plugin, which is a travel booking WordPress plugin. WP Travel Engine is a powerful plugin that allows you to easily create custom trips with detailed itinerary and FAQs. You can create trips to multiple destinations and add multiple activities to the trip. The theme also allows your visitors to book the trip that they like right away. Travel Booking Pro theme is compatible with Advance Trip Search extension, which allows your customers to easily search trips based on destination, duration, price and activities. It is compatible with Trip Fixed Starting Dates extension, which allows travel agencies to show trip fixed starting dates and number of seats available for booking. The theme is compatible with Trip Review extension, which allows users to add reviews on a trip. This helps to increase social proof and increase in sales. Travel Booking Pro theme is compatible with Group Discount extension, which allows travel companies to provide group discount to their customers. You can display Video, Image, or Slider on the banner section of the Travel Booking Pro theme. For video, you can upload it to your website or embed it from Youtube. For the image, you can add a single image or randomize multiple images. You can also add newsletter in this section. For Slider, you can use Post, Category, or Custom Fields and adjust the speed and animation. Sort the order of the sections in the Homepage as you wish by drag and drop and customize your website as per your need. You can create a one page travel website with Travel Booking Pro with it’s One page menu option. Travel Booking Pro comes with 4 pre-built custom pages including about page, contact page, team page, and testimonials page. These pages will make your website truly unique and organized. Search engines will fall in love with your travel and tour package website. Travel Booking Pro WordPress theme is a speed optimized WordPress theme, which means your website will load faster and your visitors will have a smooth browsing experience. The theme, with its speed, will help you keep your customers and get new leads easily. Travel Booking Pro allows you to easily change the color or the background image of the footer to give it a most pleasing look. Let the Menu follow the user as they scroll down the page. The floating menu makes a more efficient user experience as a user no longer has to scroll all the way back to choose an item on the menu. Let your website visitors easily switch the language of your website into the one they feel the most comfortable with a simple multilingual switch menu. With the ability to choose any color and customize the color scheme as per your choice, you can easily change the look and feel of your website to suit your brand. With the included Google Fonts, you can choose from over 600 fonts for your site and customize the looks as you desire. Take your visual appearance to the next level by choosing from a huge collection of included fonts. Mix and match your font color, size, and style to find the perfect look for your brand. You can easily Change the body and Header 1, Header 2, Header 3, Header 4, Header 5, and Header 6 Typography. Travel Booking Pro allows you to display your social media links on your website so that your visitors can find you on social media. Social media on your website will also help you boost your business’ engagement. The theme also supports Russian and Chinese social media like OK, VK, Zing, and others. You can add unlimited social media on your website. Travel Booking Pro features a powerful options panel that allows you to easily customize and configure your themes. You can easily edit, add or remove any section from your Footer on Travel Booking Pro. With custom-made widgets, you can easily customize your website, use it to promote yourself or your posts, and improve the user experience. Blogs are a great way to attract new website visitors and built trust. Travel Booking Pro has beautifully designed blog layout for your blog posts. Travel Booking Pro is cross-browser compatible so that all of its features work in Chrome, Firefox, Internet Explorer, and Safari. Highlight Author Comment displays comments made by a post’s author in a distinctive style so that it gets the attention. It is useful in the post where the users will be specifically looking for the author’s responses. Manage your contributors and let your visitors follow their favorite writer with beautifully designed author box. The theme lets you add a picture and biography of your Post author which helps to introduce and give recognition to your writers on your website. Choose from various different types of pagination style befitting your requirements to help visitors with an easy navigation on your site. Travel Booking Pro supports Right to Left scripts so that various types of languages will be displayed properly on your website. Simply add a translation file and your site will be translated into your preferred languages with the Travel Booking Pro translation ready feature. Travel Booking Pro is WooCommerce Plugin ready. So you have got everything you need to start a powerful online store and manage it like a boss. Help search engines and ease navigation for an ultimate user experience on your website with the help of breadcrumbs included in Travel Booking Pro. The text and design of the Travel Booking Pro are optimized for readability with structured sizing, great contrast, and ample spacing. Travel Booking Pro utilizes only the best practices for code implementation, which improves performance, security, and makes it very easy for you to customize if needed. The theme comes with built-in Live Customizer. Configure the entire website with an instant live preview. We have included extensive documentation to help you understand how to use Travel Booking Pro and customize it as you desire. Got more questions or ideas? Feel free to contact us through our support forum. We are here to help you and answer your questions.